After the Easter baskets have been raided and the chocolate's gone, life can feel a little ... empty. But thanks to modern technology (aka freezers), the Easter celebrations can continue. Reese's limited-time chocolate-peanut butter eggs are going to be frozen to preserve the joy of spring ... all the way into summer. And a select 500 lucky lovers will get a delivery of frozen Reese's eggs — 36 packs of eggs, to be eggsact. On Tuesday at 3 p.m. 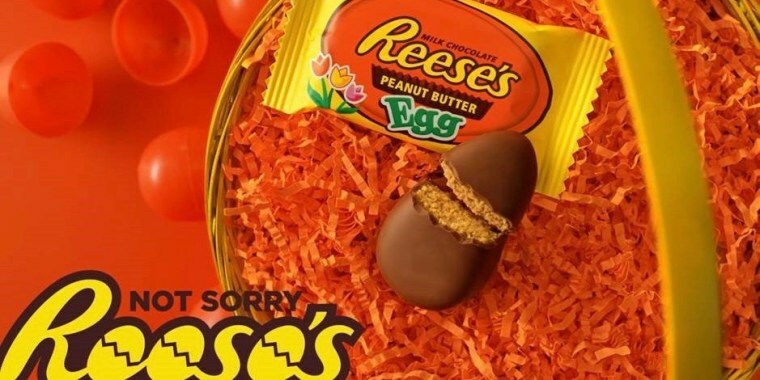 ET, Reese's social media channels (Facebook, Twitter, Instagram and Pinterest) will post a link for folks to claim their Reese's Eggs. Once the link is clicked, winners will be rewarded on a first-come, first-serve basis. If all 500 offers are not claimed immediately — which we can guess from past sweepstakes like winning a one-day trip to Hawaii with Arby's, the slots will fly out the window (or freezer door) fast — the contest will last through Friday at 2:59 a.m. ET. Perhaps even more than Arby's, devout Reese's followers can get really, really excited about anything related to the peanut-butter cup. And the company rewards and recognizes that. It once launched a series of billboards around Tennessee looking for one of its fans, just to bestow a bunch of free Reese's merch upon him. Another married duo obsessed with the classic cups named their daughter Reese's because their last name is Cupp. Now that's commitment. Those who score the promise of 36 sweet snacks to come when the Easter goods run dry (aka eggsperts) will also get the gift of surprise. That's right: The egg-freezers at Reese's will not disclose the exact delivery date of the frozen eggs until a couple weeks in advance. Until then, no one will know when this dream treat will arrive — just that they'll receive it on the perfect summer day. Then again, what day isn't perfect when it comes to a box full of chocolaty-peanut-buttery eggs?